TORONTO -- John Tavares might be one of the most well-known athletes in the professional hockey world, but he might not be the most famous member of his family. That would be the "other" John Tavares. Confused? We'll try to explain. Before there was the overwhelming hype surrounding the 18-year-old hockey star, there was John Tavares, all-time leading scorer in the National Lacrosse League -- and the uncle of the burgeoning hockey legend. A two-time NLL MVP, Tavares is the Wayne Gretzky of lacrosse -- the league's all-time leader with 671 goals, 749 assists and 1,420 points in 17 years with the Buffalo Bandits. In 2009, at age 40, he led the league with 51 goals and was fifth with 94 points. The hockey-playing Tavares grew up playing lacrosse and watching his uncle. As a youngster, John would attend Bandits practices and serve as a ball boy during games. He also got an early education in how a superstar is supposed to handle himself. 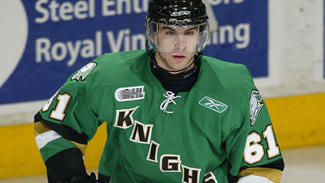 "I learned a lot from him, the way he was as a player and a leader and a teammate," Tavares told NHL.com. "He did wonders for me, with me not even knowing it. He's been great for me." Uncle and nephew are close, and the younger Tavares was given a nice indoctrination to athletic fame through his uncle. "I would think that over the years I've had a positive effect on him," said the elder Tavares. "Being in the arenas, being in the change rooms, being comfortable with being in large arenas, that would help him. Me dealing with media, maybe he paid more attention. I would hope that I have a positive effect on him, made things easier for him to move into the NHL. Hopefully he's comfortable with dealing with media, with the pressure. Over the years I've tried to give him a few pointers here and there, but I'm not the type of person who goes out and tells someone what to do. But when I do tell him something, he listens." The younger Tavares certainly was paying attention. He said watching the way his uncle acted off the field has had a tremendous influence on how he deals with life in the spotlight. "As a teammate, that's where I learned a lot," Tavares said. "The way he was and how he involved all the other players, even though he's the best player on his team and in the league. He makes everyone feel a part of his success and the team's success. He just tries to make everyone feel they're as important as he is in the team atmosphere." Because of his skills on the ice, Tavares has been the center of attention since he became the first player granted "exceptional player" status and was drafted into the Ontario Hockey League at just 14. That kind of attention would be crippling to almost anyone, but Tavares said what helped him was having a famous relative as a role model. "It helped me in ways as a kid in dealing with pressure and with the eyes on you all the time," Tavares said. Uncle John also always was available to lend a helping hand. "There were a few times he came up to me his first and second year, said there's too much media pressure," the elder Tavares told NHL.com, "and I helped him deal with it." What the uncle sees in his nephew makes him proud. "If he's showing up a little bit I'm going to cuff him on the head, but I've never had to do that with John," said Tavares. "Sometimes you can say the right things, but the way you play is totally different. They talk team-team-team and then they go play and they're selfish and their hogs, the way they carry themselves is totally different. John plays the way he talks. He really does love playing the game, he wants to make his teammates better, he wants to win. It's not about how many goals you score; he's going to make the right play rather than the selfish play when he has the puck." Besides learning how to act off the ice from his uncle, the younger John used lacrosse to add to his hockey skills. "The biggest is moving in traffic, shooting in traffic, making plays while guys are on you," Tavares said. "When you're able to do that, you're able to draw guys toward you, make those plays in traffic, I think it creates a lot of chances offensively. Also rolling off checks -- when you roll off checks or lean into guys, use your body to create room, you do a lot more of that in lacrosse because it's such a possession game. You learn to make room for yourself, like in hockey. I learned a lot of those things, working the puck down low in front of the net to make room for myself, get shots off or make plays and create scoring chances. Obviously hand-eye coordination is a big one as well. And it's a physical sport so you learn how to play that physical style. "Your reaction time, how you react to certain things, your quickness, your explosive power on the ice when you see the puck go different directions (and) probably lacrosse adds to your hockey sense -- you try to read the play as well, do things like that. Definitely translates a lot." Lacrosse was as much of a passion for Tavares as hockey. He started playing both sports at the same age, and he played competitive lacrosse every summer until he was 16. "Lacrosse was a great thing for me because it let me get away from hockey for the summer as a kid," Tavares said. "My mom never really believed in the summer hockey, all year-round. I needed a break and I always looked forwarded to the lacrosse season. And when hockey season came around I was really looking forward to that. It was good both ways to help myself in both sports." Now, though, Tavares is all about the puck and the ice. "I loved lacrosse, too, it's a great passion of mine," Tavares said. "It was tough to give it up, but you know it has to be done when the commitment gets this high, this level of hockey. I was a pretty good lacrosse player. ... I wish I could play both. But I fell in love with the game of hockey first. Hockey always has been my ultimate passion." He's given up the sport, but still finds time to watch games. He got to see his uncle play in person once this season, while Uncle John has watched with pride as his nephew has developed through four OHL seasons. "Overall I would hope I influenced him," said the elder Tavares.